A fabric awning can last you years with the proper care and maintenance! When you invest in an awning for your business or home, you want it to last as long as possible. A big part of increasing your awning lifespan is by making sure you are maintaining it properly. While awnings don’t require a huge amount of maintenance, good care is still essential. Here is how to properly care for your fabric awning. 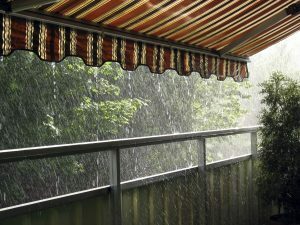 In order to prevent stains and mildew from accumulating on your fabric awning, you want to clean it regularly. You can use a hose to easily clean off any dirt and debris that has accumulated on your awning. For a deeper cleaning, you can add a mild soap to remove any dirt that may be caked on. You can use a broom to clean the underside of your awning. Bushes, Vines, and Trees, Oh My! Any plants that rest over top of your awning can be the reason for a lot of the debris build up. Organic substances such as tree sap can actually cause damage to your fabric awning because they are slightly acidic. You want to trim any trees, vines, or bushes that can fall off or leak substances onto your awning. When it’s time to take your awning down, whether to clean it thoroughly or to put it away from the season, be careful not to drag it across the ground. If you drag your fabric awning across the ground, rough surfaces such as the sidewalk can wear down the fabric, eventually leading it to tear or rip. When cleaning your awning, make sure to use a very mild soap. Harsh cleaners can cause damage to your fabric awning. In addition to this, things like sunscreen and bug spray can damage the fabric, so be careful not to use those sprays directly underneath your awning. After you clean your awning, make sure it is in a space where it can dry thoroughly. When storing it away for the season, make sure you do not store it in a place with a lot of moisture because it can start to mold. In addition, allowing water to pool on top of the awning can cause the fabric to stretch and weaken. Contact Carroll Awning For Your Fabric Awning Today!